Thursday, October 12, 2017 ~ 11:00 a.m.
Wednesday, October 11, 2017 ~ 6:00 – 8:00 p.m.
Rhonda L. Biede, 68, of Ashland, NE, became our guardian angel at Lakeside hospital surrounded by her husband, daughters, sons-in-law and grandkids on Sunday, October 8, 2017. She was born September 30, 1949 in Tilden, NE to James and Donna (Lind) McClatchey. 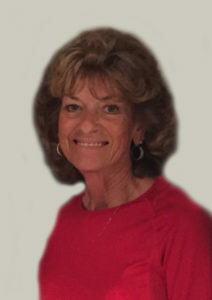 Rhonda attended Ashland-Greenwood High School. On October 2, 1976, Rhonda was married to Bert Biede near Valley, NE. Rhonda cared for many children in the Ashland area over many years of daycare service. She owned and operated Kiddie Kastle Day Care that she opened in 1990. Rhonda always went out of her way to help anyone in need. Family was her life and she always loved watching her grandkids activities. Rhonda’s hobbies were caring for her plants and cleaning her house. She is survived by husband of 41 years, Bert Biede; children, Stacey Ghumm, Michelle (Korey) Grell, Mindy (Chad) Riecken and Cortney (Terry) Zimmerman; grandchildren, Colton and Hailey Ghumm, Jade, Dawson, Deklin and Walker Grell, Cole and Kealie Riecken, Lane, Drake and Ranger Zimmerman; great-grandchildren, JoVee and Emree Ghumm and Maverick Meinke; brother, Steve (Marilyn) McClatchey; many other family members and friends. She was preceded in death by father, James McClatchey; mother, Donna Winters; step-father, Jesse Winters; brother, Scott McClatchey; and sister, Marsha McClatchey. Thinking of you with deepest sympathy. Was so very sorry to hear this. Hold close all the great memories. Always love see all of the outside decorations up. Prayers to the Biede family. Rhonda was such a special lady………………with our deepest sympathy. So sorry for your loss. Rhonda was an incredible lady that will be dearly missed. Rhonda was a friend of mine for over 55 years. We went to school together during our teen years and had many good times. We lost contact for awhile while we were raising our families but the last ten years we shared many more memories. She was my best friend and even after all the years apart we never skipped a beat. I will miss you so my friend. Recently for her birthday I sent a wind chime with a redbird on it. Beautiful and I have always been told that a redbird visit is from someone in heaven. I got me one too at the same time. I can look out my front window and see my redbird and think of you. All my condolences to Bert and girls all of their lovely families. Condolences to Steve McClatchey and Marilyn and families. God be with you and bring you much comfort. Till we meet again Rhonda. Love you. Bert and family so sorry for your loss. May God wrap his loving arms around all of you. I was so saddened to hear of your loss. It was an honor to have known such a beautiful lady. Rhonda brought so much love, happiness and smiles to me everytime I would see her. God has truely gained a beautiful angel as I feel I did when I meant her. May your family find strength in the days ahead. My heart and prayers go out to all of you. My Sincere condolences. Cortney my heart breaks for you, your family and your sisters. I cannot imagine the pain you guys are going through, hold tight to all the memories you have! Our hearts are heavy and tears are falling for the loss of Rhonda. The world will be a colder place without her. Her wisdom, guidance and acceptance of everyone around her will be remembered always in our hearts. Much love to all of her family. Our family sends our deepest and most sincere condolences for the passing on of Rhonda, who was dearly loved by our entire Family. Comfort, Peace, and Love to each of you, and please let us know if we can help you with anything!